That’s kind of how my family rolls, and that’s basically been my philosophy with wine. I don’t claim to be the most educated wino out there and I certainly can’t sniff out a specific grape, vintage or vineyard with a blindfold on… but I’m open to trying any wine and it’s rare I come across one that I really don’t like. I always wondered if I would have a “discerning palate” to be able to distinguish the difference between a $10 bottle and a $100 bottle. Which bring us to… the mystery of the Chianti Riserva. While we were home visiting my parents, my sister asked if she could open a bottle of red wine instead of the white my mom already had opened. My mom doesn’t drink red, so she waved my sister into a pantry with a wine rack full of reds that people had given them as gifts over the year. 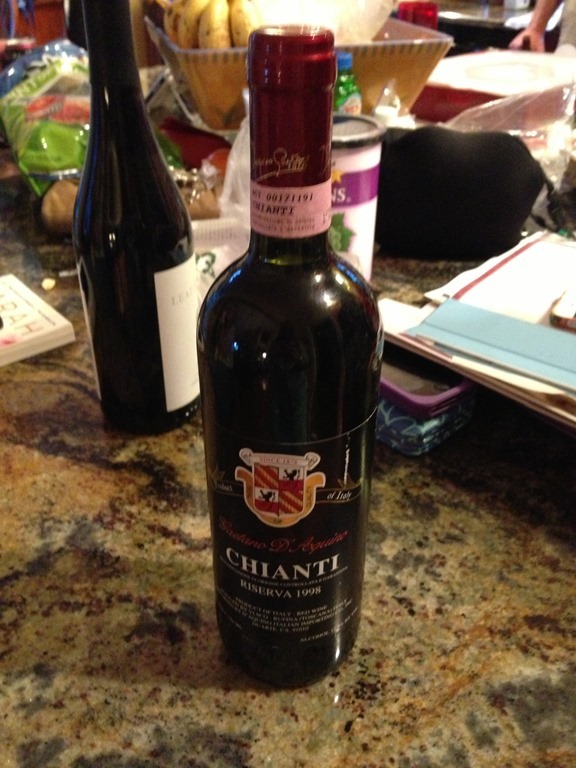 She selected a Chianti, we opened it and drank it with dinner. It was a dry, aromatic, heavy red that paired well with the steaks we were having. It was pretty much what you’d expect from Chianti – some notes of tobacco, cherry and a little bit of a bite at the end. It didn’t strike me as being remarkable, but I did appreciate it more after it had been open for awhile and had a chance to breathe. I try not to read anything about the wine before I’ve written down some notes, but if I haven’t bought it myself I always look up the price afterwards to include in my review. For the most part, it looked liked Gaetano D’Aquino Chianti Riserva comes from Trader Joe’s and is priced at about $5.99/bottle. However, we were only finding listings with vintages from 2006, 2008, 2011. So, we did a more specific search and came across one site that listed the 1998 vintage at $161/bottle. Say whaaaa? That was, unfortunately, the only site I found with any information and even an extensive search on WineSearcher and WinePrices (which search auctions over the last few years) turned up nothing… so I’m going with the assumption that we’re more on the $6 side. But, who knows? (And if you do know… please share!) But as far as my “discerning palate” goes… well, let’s just say it’s useless for discerning the price tag of a bottle by taste. Which, for my wine budget, is probably a good thing.